Fuzion is based in Oakland, CA and seems more like a community than just a company. 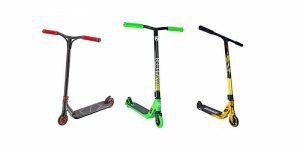 They have plenty of products on the market right now and are happily endorsed by many professionals using their pro scooters for their competitions. 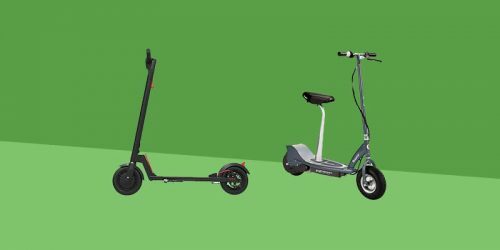 Fuzion’s Z-Series scooters have had a big redesign this 2018, they’ve promised a versatile, reliable, and resilient series of scooters that above all else can give as good as it gets from any pro scooter rider. The Z300 is somewhat of a middle ground in terms of size, and is getting rave reviews from the majority of its customers. Let’s see what we think! 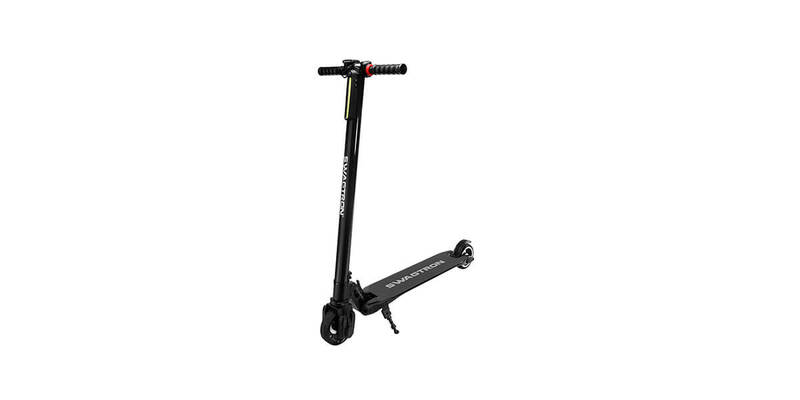 The Z300 stands at 23” tall and 22” long, with 22” Chromoly riser handlebars and a reasonable 4.5” wide deck. The deck and neck are aluminium, and the wheels are polyurethane. 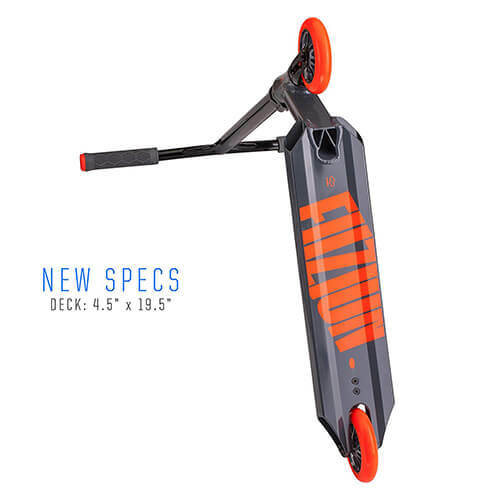 This scooter is lightweight, coming in at 7.8lbs, with 110mm PU wheels which have an aluminium core. Generally this pro scooter has a very solid, high quality build design, as you’d expect from a company like Fuzion, and just about any respectable pro scooter manufacturer. 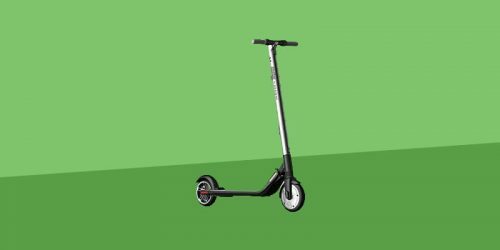 We liked the Z300 so much that it made it onto our list of the 11 Best Pro Scooters. Straight out of the box the only assembly you’ll need to be doing is inserting the T-bar into the deck and tightening it with the allen wrench (this comes in the box) and the triple bolt clamp, once that’s done you’re good to ride! 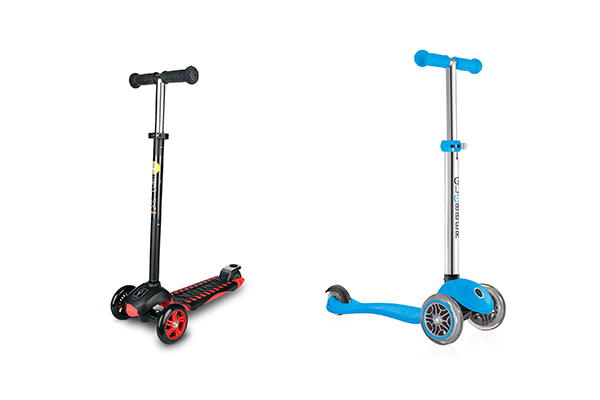 The Fuzion Z300 has a design that could be said to be directed towards younger riders who may be beginners, comparing it to its upgrade the Z350, it’s got a shorter T-bar and deck, but overall this pro scooter could easily be used (and is used) by any professional. 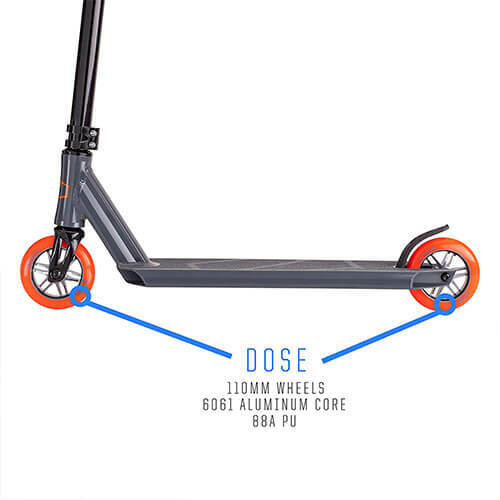 The deck is made of 6061-T6 aluminium alloy, the T-bar is chromoly steel, a stronger and more costly upgrade of carbon steel, and the one-piece fork is made of steel. 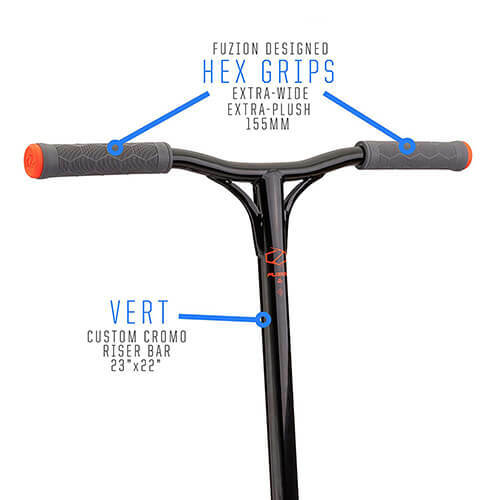 The grips on the riser handlebars are 155mm each and are made of a rubber compound developed by Fuzion. These are designed for a luxurious and comfortable grip. The wheels are 110mm, only slightly smaller than the Fuzion Z350’s 120mm wheels. 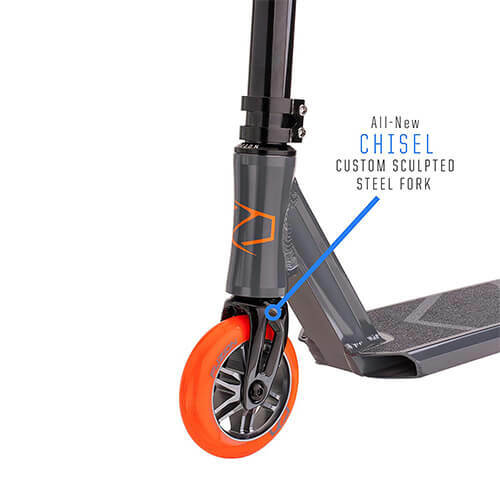 These wheels have aluminium alloy cores and have polyurethane outers, polyurethane is used in wheel manufacturing for many reasons, but they’re applicable to pro scooters due to their gripping force, which provide good traction and a great driving force. 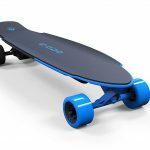 Fuzion have given their wheels ABEC 9 bearings, the ABEC scale is a ball bearing scale ranging from 1 to 9, 9 being the most efficient bearings, and generally producing the greatest speed. Moving onto the deck, measuring in at 4.5” x 9.5” (W x L), this is a comfortable size, yet it avoids being bulky or larger than it needs to be. The deck has a 3 degree concave top to help keep your feet in place, with a flat bottom and rails designed for grinding. 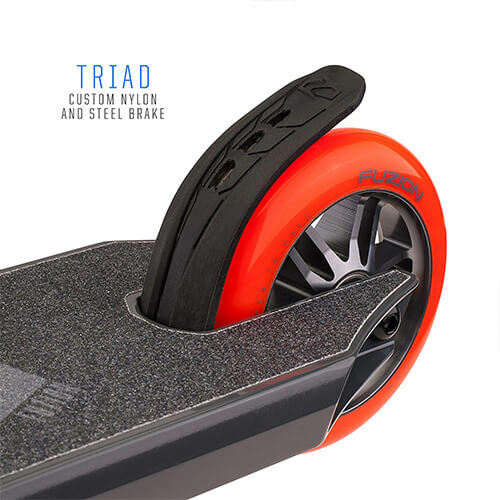 The brake is Fuzion’s own Nylon and Steel Triad brake, this gives you great control over the speed and is essentially noiseless. The Fuzion Z300 uses an IHC (internal Hidden Compression) system, which is known for being reliable and lightweight. 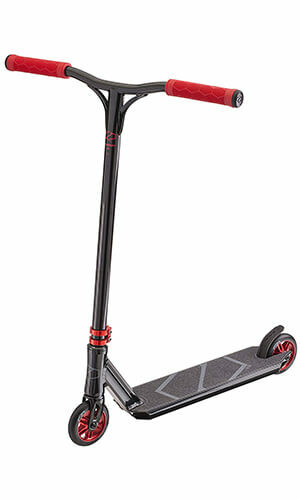 The Z300 has the build quality of a high-end pro scooter, and the ride is no different. You can definitely be as aggressive as you want with this thing without worrying about damaging it in the slightest. The steering is very easy and when riding it I felt like I had a lot of control, and due to this a lot of confidence can be built up very quickly on this scooter. 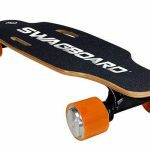 The wheels are smooth and have great grip, and the deck is big enough for both of my feet to fit on it comfortably. The T-bar could potentially cause some problems with some fully grown adults as it may be on the shorter side, and in that case it is worth looking at the Z300’s successor the Z350. 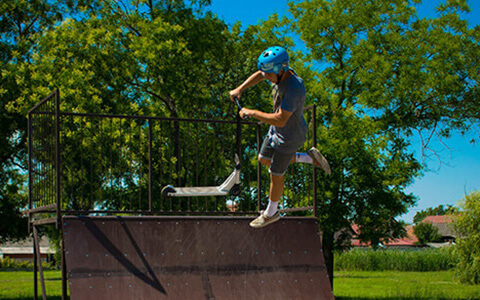 The scooter itself is lightweight, perfect for performing tricks and ease of transportation. The rubber handlebars have a comfortable feel to them and you can get a firm grasp. 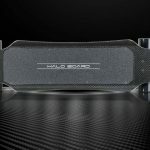 Handlebars – These have an ergonomic feel to them and are a nice comfortable length that I think will make your ride a lot more intuitive. Build quality – This is really an all-inclusive point that I’m making here, the Z300 has very few flaws that I can see and the general build and design of it is superb. Price – This point goes hand-in-hand with my former point. 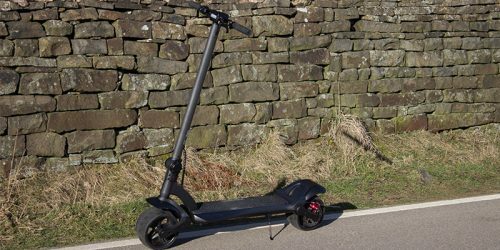 This scooter is advertised towards intermediate sportsmen – and for good reason – but comes at a price that is accessible to beginners and those that don’t want to spend their life savings on something that may just be a hobby. Height – For anyone who feels they’re a bit too tall for the Z300’s handlebar height of 23”, I’d recommend looking at the slightly larger pro scooter Fuzion has to offer; the Z350. 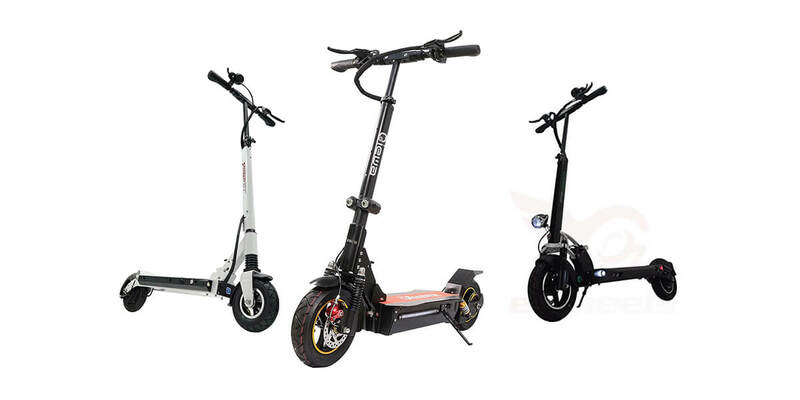 The Fuzion Z300 is advertised as a pro scooter that can be used by beginners and intermediates alike, I really like this concept and I am inclined to agree – Fuzion has refused to cut any corners with this product and I would personally recommend it to a professional or someone just looking to pick up a new hobby. This scooter has a great built and is made of high-quality materials that will last a long time – the steering is controlled, the wheels are smooth yet grippy and the handlebars are comfortable and wide. All in all i think this scooter will give you one of the best rides you can get, no matter what level you’re at.